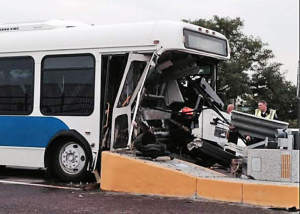 Thomas M. Power, a partner at Power Rogers & Smith, filed a complaint in the Chicago O’Hare bus crash that occurred on August 29, 2014. The crash occurred when an airport transportation shuttle bus drove straight into a concrete lane barrier, very close to the O’Hare terminal. Several passengers were injured in the crash, requiring the assistance of several paramedics and various emergency transport vehicles. Mr. Power filed the suit on behalf of a husband and wife who were aboard the shuttle at the time of the crash and who suffered serious injury as a result of the crash.